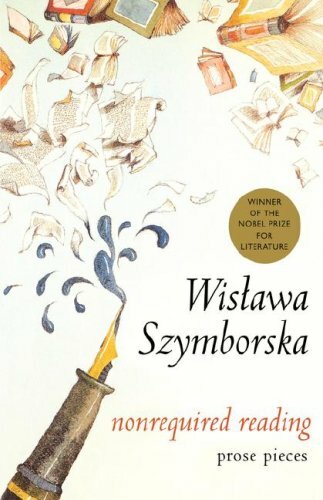 In the author&#146;s note that opens Nonrequired Reading, Polish poet and Nobel laureate Wislawa Szymborska writes about a reader&#146;s freedom: to read intelligent books or stupid ones, to stop long before the end of a book, to eavesdrop, to argue. This collection of short book reviews is a lovely gift to those who share her sense that reading is &#147;the most glorious pastime that humankind has yet devised.&#148; The essays here are wry, gentle, provocative, skeptical, and fearless. When she reviews Wallpapering Your Home, Szymborska doesn&#146;t comment on the techniques suggested by the author &#150; at least, not on the wallpapering techniques. She instead imagines the efforts a reader must undertake just to acquire the necessary tools: visits to stores of dubious inventory, dropping in on friends to see if the tools can be borrowed. This poet&#146;s reading reflects her rigorous and fascinated engagement with the world. Books are not her escape from mundane matters. In her Nobel speech, she said, &#147;Whatever else we might think of this world &#150; it is astonishing.&#148; In Szymborska&#146;s work, there is a profound generosity and that willingness to be astonished. There is also a stringent, disciplined insistence on questioning cliches and received notions. As a reviewer, she is as dismissive of academic cant as she is of enthusiastic sentimentality. This is not a book best gulped down in one sitting. For one thing, the breadth and charm of the book reviews encourage one to seek out further reading, if not always the exact titles under Szymborska&#146;s scrutiny. The brevity of the pieces allows for disconnected readings on commuter trains, in doctor&#146;s waiting-rooms, or in other dull but inescapable places. Her voice is the best kind of company for such ordinary situations.